AUC Films Screened in Tribeca… and Live Blogged! Tonight, we screened seven of the films from my documentary courses in Egypt at a special event sponsored by the American University in Cairo and the International Center for Journalists. It was a posh event at the fancy screening room of the Tribeca Grand Hotel. The audience was set to be a sellout, until the weather turned nasty, so we had a slightly smaller, but very receptive and appreciative audience, and some really good food. 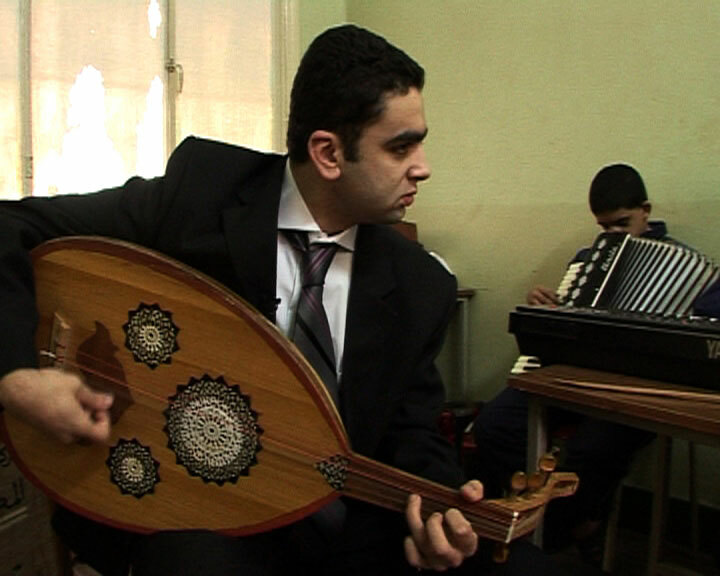 One of the student filmmakers — Alaa Al Dajani, who did a short film called Resonance, about a blind player of the oud, a Middle Eastern lute (Mustafa, pictured at right) — came to the event, from Cairo, and will explore graduate programs for the next week or so. And I’m roping him into talking to my students at Princeton tomorrow. The event tonight was live-blogged by Annie Shreffler, a student at the Graduate School of Journalism at CUNY, who made real time comments about the films as she watched from the projection booth, and got guest comments at the reception afterward. She didn’t only interview Alaa. Don’t think we didn’t notice that she alsointerviewed you.